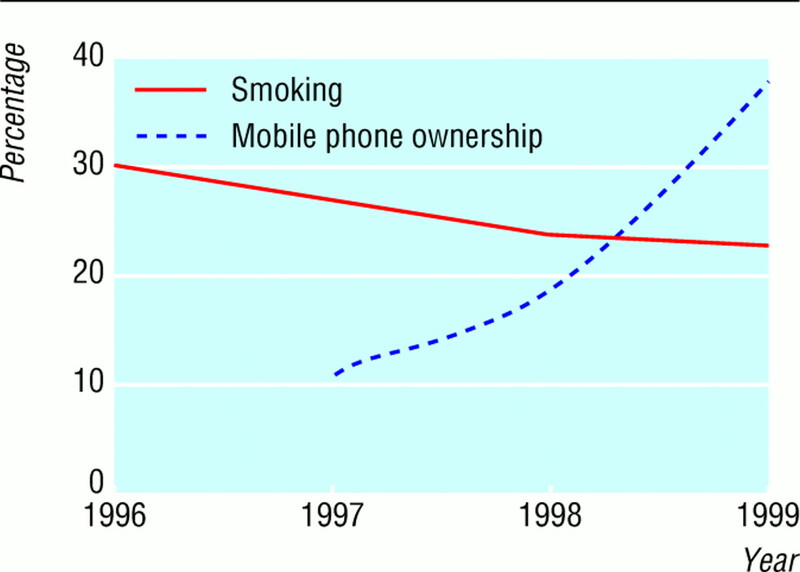 We hypothesise that the fall in youth smoking and the rise in ownership of mobile phones among adolescents are related. The functions that smoking offers to teenagers have been extensively studied,2 and we argue that the mobile phone is an effective competitor to cigarettes in the market for products that offer teenagers adult style, individuality, sociability, rebellion, peer group bonding, and adult aspiration. The marketing of mobile phones is rooted in promoting self image and identity, which resembles cigarette advertising. As ownership increases, mobile phones will become essential for membership of peer groups that organise their social life on the move and by means of mobile phones. Over the period in which smoking rates have fallen among 15 year olds the ownership of mobile phones has sharply increased, having risen from low rates in the early 1990s (figure). The trend in ownership of mobile phones has continued sharply upwards, with ownership reaching 73% among 15-24 year olds and 70% among 15-17 year olds by August 2000. To explain the link with declining teenage smoking, mobile phones are particularly important as they consume teenagers' available cash, especially the pay as you go cards. If some teenagers cannot afford to smoke and pay for a mobile phone or they find that owning a mobile phone satisfies the same needs as smoking, they may decide not to smoke. Smoking may become seen as old technology, with the bright new world of text messaging, email, WAP, and 3G phones becoming the new aspirational gateway to adult life. Given the continued rise in ownership of mobile phones, will the trend continue? Data on teenage smoking are not yet available for 2000, but if our hypothesis is correct the need to own a mobile phone will be providing vigorous competition for the spare cash once spent on cigarettes, while meeting many of same the needs.
. Drug use, smoking and drinking among teenagers in 1999. London: ONS, 2000.